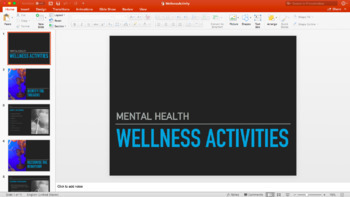 This Powerpoint is a guide to assist a teacher in presenting Mental Health and wellness activities. The presentation covers ways to identify and recognise mental health issues in an individual and how to implement and reflect on strategies and techniques to assist the individual facing mental health issues. Mental health is an increasing issue in today's society. Lets work together to helping our students.